Circular Floats – Discover Oregon | Timelapse videos, guides, and licensing. There’s a couple of ways you could go about getting shots like these. 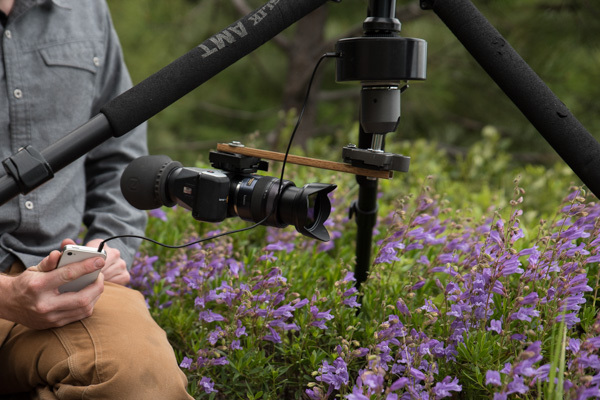 Traditional circle shots are done on a dolly and track – but with the size of today’s cameras means this is no longer necessary for most independent filmmakers. 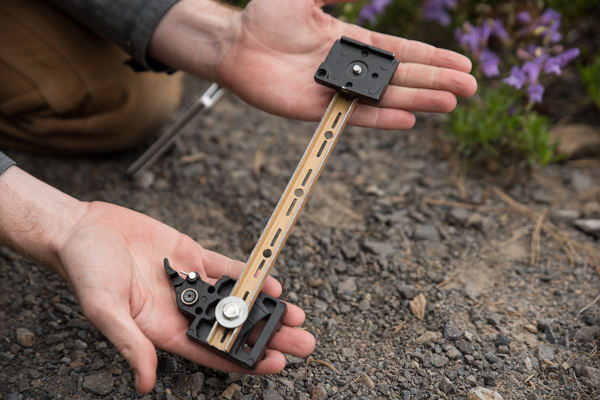 Pint sized cameras like the Blackmagic Pocket , Sony A7 series, and Panasonic GH4 can simply be suspended on an arm connected to a motorized pan/tilt device beneath an inverted tripod – like this Alpine Labs Radian. 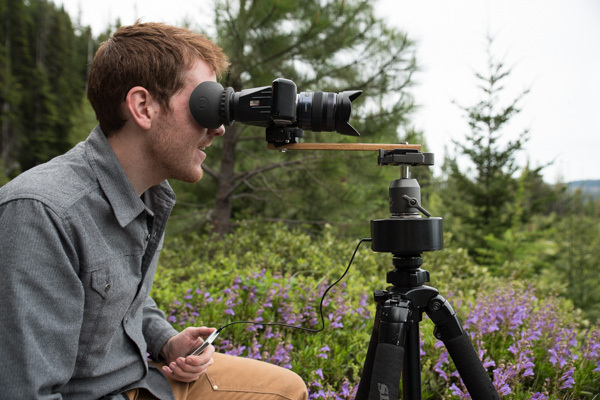 My Blackmagic has a mount on the top – but you could also of course shoot upside down from a normal mount and flip in post. Adding the arm helps give you a really interesting change in perspective on your object of interest (such as a product!). I have two devices for circular shots. One is a very robust – and heavy – modified Meade Autostar telescope mount. This is strong device good for shots with larger circles but it’s not very packable or useful for ultra close-ups. For a closer macro shot and a lighter setup I use an arm attached to Alpine Lab’s ‘Radian’ using the direct drive panning feature. I most often suspend the camera as shown above to a strong tripod. Suspending the shot allows me to put the axis of rotation directly on top of an object and float in a perfect circle around it. A lot of times I don’t need a full circle or want to include a background object like Mt. Hood and will just shoot between tripod legs. But it’s also possible to shoot from above and float in a full 360 degree circle. Sometimes I’ll place this setup on top of a tripod when I don’t need to get as close to the ground or just want a perspective change in a normal panning shot. There’s a lot of shots like this in the Discover Oregon film. 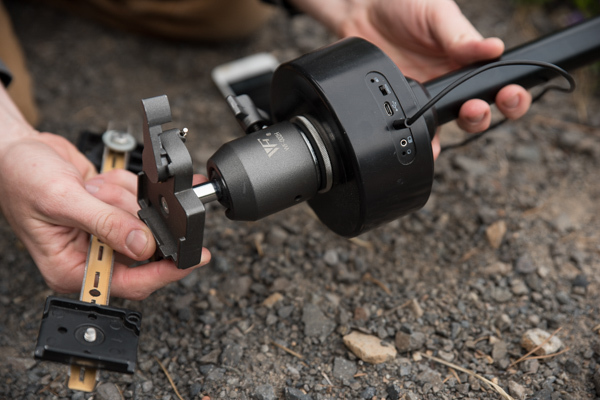 It’s quite to do this setup yourself – the same concept applies to any sort of motorized pan-tilt device! Make your arm by taking a small length of steel such as this closet railing, expand the holes to fit standard ¼” bolts, attach a quick release plate at one end and a quick release mount at the other. Available cheap on eBay. Use caution and be careful not to make this too long or you’ll put too much strain on the motor! Maximum length depends on the weight of your lens, camera, tripod, and the motor device. 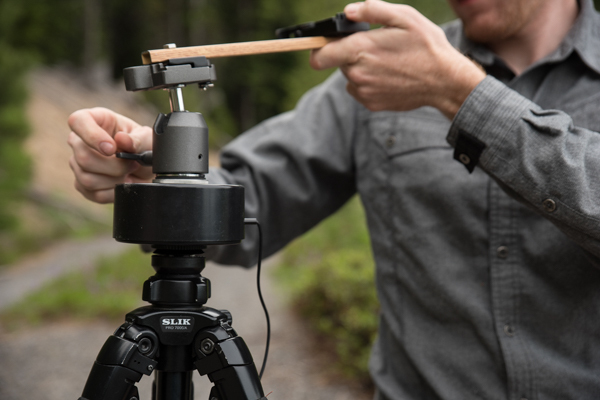 You’ll then want to then attach this to a perfectly level Radian suspended beneath your tripod. This keeps your axis of rotation from going askew during the shot! I accomplished this by purchasing a 1/4″ to 3/8” female-female adapter from Amazon. I then use a bubble level and adjusting the tripod legs to balance each shot. 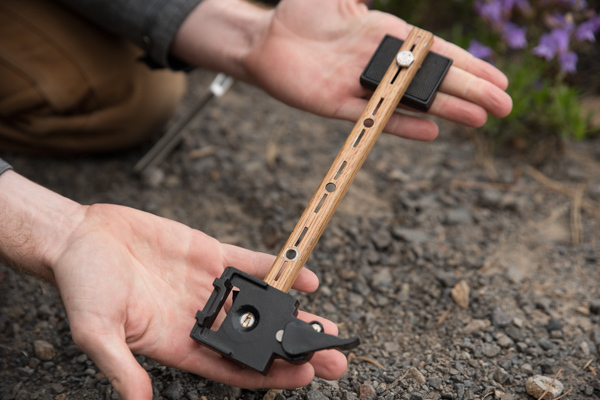 You could then attach the arm directly to a quick release atop the Radian – but then you’d be limited to only horizontal shots. I like to vary the angles of my circles – so I added this strong ball head on top of the radian with a 1/4″ to 3/8″ male-male adapter. Then just click your camera into the arm, the arm into the ball head, and you’re good to go! Be VERY careful and make sure everything is locked down solid; you don’t want your camera to fall off. Use direct drive to control the device. Happy shooting!